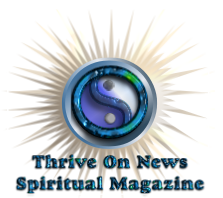 Thrive On News - Free Spiritual Magazine. With insights into Astrology, Medium-ship, Druidism, Psychic readings,Personal development,Original New Age meditation music and much more, come join us stay awhile do a bit of reading watch a movie or have a meditation or try your hand at doing your own relationship numerology. Developing our all natural psychic intuition through spiritual awareness.